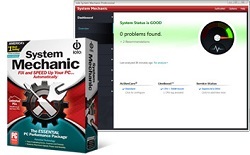 System Mechanic provides everything you need to keep your PC running like new. Fix problems, boost speed, eliminate crashes, and prevent errors and problems from reoccurring. One-click power tools perform vital services, intelligently diagnosing and resolving PC headaches and performance bottlenecks. Patent-pending ActiveCare automatically maintains the PC when it's idle. Weekly Tune-up Definitions updates from iolo Labs ensure that your PC is protected against the latest performance threats and system flaws. This award-winning and #1 best-selling tune-up software is trusted by millions worldwide to speed up, repair, and maintain their systems. One product license covers all the PCs in your home.